Okay, yeah, so Shere Khan is traditionally cast as a male, but, honestly, men can be feminists, too. And Shere Khan’s arrogance would definitely lead him to take on the feminist mantle to satisfy his own agenda without any regard for how it might appear to actual feminists. 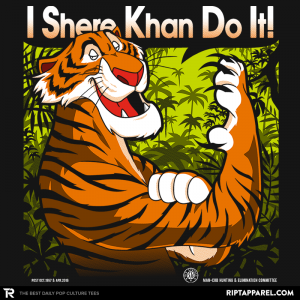 Although, to be fair, Shere Khan would never rivet a single nut in any one of his nine lives. I would pit Rosie against Khan, but I like Rosie too much. Maybe give Rosie a gun. I dunno.